Our comprehensive race card spreadsheet contains all the significant horse racing jockey statistics that any profitable gambler needs to make their betting pay. Jockey performance is essential in evaluating your bets! 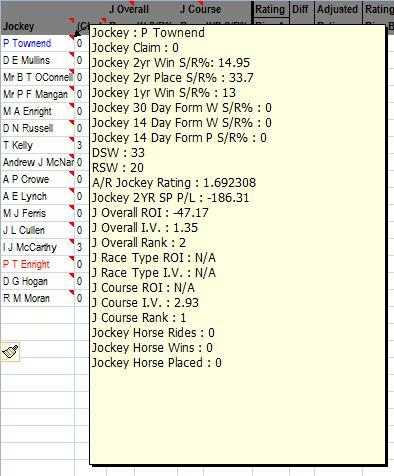 Jockey overall runs, win & place strike rates for 2yr, 1yr, 30 days, 14 days. A unique jockey rating which evaluates how good the jockey is compared to others in the race. Jockey days since last win & rides since last win. Jockey win & place course record, significant in knowing how well the jockey rides the course. Jockey course impact value rating which suggests how well the jockey performs compared to the other in the respected race, along with a course rank. The jockeys P&L stats plus their return on investment (ROI) figures. 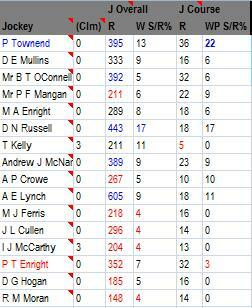 Trainer & jockey combination stats allowing you to see how good a pairing the jockey & trainer have together. Statistics on how many times the jockey has ridden the horse, with win & placed data. Ranking columns so you can quickly see which are the better and worse jockeys in the race at the course and overall. Blue & red jockey highlights which quickly help you to identify the best jockeys at the course and those who have a problem riding winners at the respected course, significant in helping you pick winning bets!